I've fallen in love with liquid lipstick in recent months, it's the perfection option for a long-wearing makeup look and red is the classic option for any celebration. 'Firey' from Stila is a deep red and although red lips can be hard to maintain, Stila have created a long-wearing liquid lipstick that won't transfer if you're inline for a NYE kiss. The formula is slightly thicker in comparison to Gerard Cosmetics's Hydra Matte Liquid Lipsticks and although it's easy to apply with the doe-foot applicator, it's highly pigmented (you really don't need much), so I find I have to brush off the excess on the rim of the tube. As expected it applies wet and dries down to a soft matte finish that doesn't bleed or transfer. If you're after big, luxurious hair, look no further than Charles Worthington Volume & Bounce Texturising Spray. The invisible spray has a slight hold and is seriously volumising, leaving my hair big and bouncy, without the need to backcomb. And I can't get enough of the scent; it smells delicious. I have got through countless cans of the stuff and always count of CW to give my limp hair a bit of 'zoosh'. Sometimes a few coats of mascara doesn't quite hack it, especially if you've been blessed with a skimpy set of lashes. So for a full on flutter, select a pair of your favourite false lashes. I've selected Nouveau Lashes Strip Lashes in 'Glamour' Style 3, they're high quality, lightweight, easy to apply, reusable and look great in photos. The eye-catching pair are full at the roots and flared at the ends, perfect for a special occasion. And remember to line the lashes up to your lid and cut away any excess - this will make them far easier to apply. I LOVE highlighter. It gives the illusion of larger eyes, leaves my skin glowing, makes my cheekbones "pop", brightens up dark areas, instantly lifts my brows and plump up my lips. If I could dust it all over my entire face daily without looking like a sweaty mess I would! Jaclyn Hill's Shimmering Skin Perfector in "Champagne Pop" is a b-e-a-u-tiful peachy highlighter that leaves a luminescent sheen on the skin. Applied onto the high planes of the face where the light would naturally catch, my skin is left looking youthful and bright. Now you don't want to rival the disco ball on NYE, so be selective about where you apply your highlighter and use a light hand. I'm a sucker for a multi-tasker and the This Works In Transit Camera Close-Up acts as a moisturiser, primer AND a face mask. Just a pump of the lightweight cream applied directly to clean (un-moisturised skin) evens, brightens and pumps my complexion, leaving it perfectly prepped for makeup. The formula's blend of hyaluronic acid, caffine, argan and starflower oils ensures my skin is selfie ready. And a little tip, you don't need all that much, otherwise your makeup will slide around. Overall I can't fault the soft finish it achieves. It works! Everything is better with a tan, right? Covering imperfections, scaring and stretch marks, fake-tan instantly boosts confidence. And Cocoa Brown's products have never failed to achieve an airbrushed, flawless finish and their latest release hasn't disappointed. Their new Instant Tan Bronzing Gel may appear dauntingly dark, but when worked into the skin it instantly leaves a gorgeous golden natural sun-kissed glow, so you won't be left looking like an oompa loompa! In fact it applies beautifully, blends extremely well and dries instantaneously. And Cocoa Brown's signature Tahitian Gardenia scent makes it pleasant to use and wear and even with the odd spillage there were no signs of fatal fake tan damage! Now removal is often a pain when it comes to fake-tan, but the wash of formula is a godsend making it perfect for fake-tan dummies. 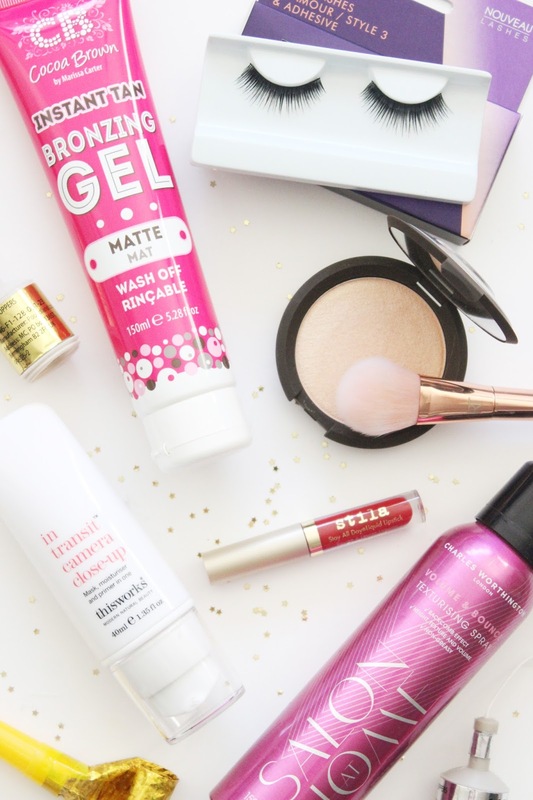 What beauty products will you be reaching for this NYE?